Parents whose kids have behavioral issues and/or mental illnesses face even more difficulties in addition to the “normal” challenges of raising a child, but they have found peer support online through forums and Facebook groups. These peer connections are crucial because, when a child diagnosed with Attention Deficit/Hyperactive Disorder (ADHD) is not doing well in school, for example, the blame is very often put on mothers. In addition, because of the nature of their children’s issues, moms are often perceived as too lenient or just bad parents (Mash & Wolfe, 2015). In reality, ADHD has several etiologies and only one of them is related to parenting, but unfortunately that is not common knowledge. Society then often stigmatizes and ostracizes families dealing with ADHD and other behavioral disorders such as Oppositional Defiant Disorder (ODD). Thus, these moms frequently find themselves without support from relatives, neighbors and teachers, making their situation even more desperate. So, it should come as no surprise that these parents are naturally eager to receive any kind of support, even if it is online. Sociology Professor Juanne N. Clarke and her colleagues Gudrun Van Ameron and Laura Lang from the Wilfrid Laurier University in Waterloo, Canada, have conducted two discourse analyses studies in three blogs dedicated to ADHD and a helping forum dedicated to ODD. 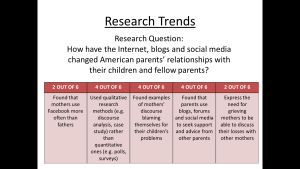 Professor Clarke and her colleagues examined the content, wording and overall tone of the posts in these two platforms, looking for patterns in discourses and analyzing how users usually responded to each other. The researchers found that the vast majority of users in all blogs and the forum are mothers, and that “it is to the blog these mothers go to get information and support.” Another common type of thread is a parent relating his or her child’s newly founded diagnosis, normally expressing despair and the struggle to come to terms with it. The studies have also found that parents constantly “reinforce to one another that they are not to blame, that others don’t understand and that (with blog support) they are not alone.” Clearly, these parents rely on these communities to find support on a daily basis. With the popularization of Facebook, several forums (including the ones Dr. Clarke and her colleagues examined) have migrated from independent websites to Facebook groups, most likely because it is more convenient for users to participate. There’s no need for two separate logins, and since most adults are already on Facebook, it is easier to aggregate people with a common interest. 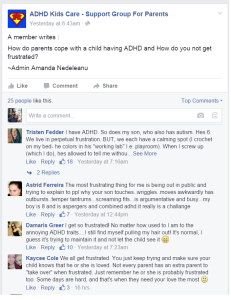 A search on Facebook shows there are several support groups, communities and pages for parents of children with ADHD, and one of the most popular is ADHD Kids Care – Support Group For Parents, with more than 30,000 “likes.” On this community, users can submit questions anonymously to the moderators, who then post the question on the page. Facebook groups such as ADHD Kids Care allow parents to protect their privacy while providing users with peer support and information. The open but anonymous format is a great alternative to closed groups because anyone can benefit from the information shared there. If a parent does not want to join an ADHD support group for fear that his or her friends will see it and make assumptions about his or her child, they can simply “lurk” on this open page or even submit questions without sacrificing their privacy. The possibility of keeping a child’s diagnosis private online is invaluable, since granting the world access to our private lives has become the new normal in our society. It’s important that parents have the option to get answers and support without possibly jeopardizing their child’s shot at a job or school, for example, because of their diagnosis. It might sound far-fetched, but several companies use social media as a tool in recruiting and screening potential job candidates, and we can only expect this practice to increase. Of course it would be preferable that ADHD and other disorders did not carry a stigma anymore in the future, but that is impossible to predict. Until then, pages like ADHD Kids Care allow parents to get answers and support one another without exposing their kids online. Certainly, saying that raising a child with behavioral problems is difficult is an understatement. Unfortunately ADHD and other disorders still carry a stigma in our society, even though its prevalence ranges from 5% to up to 11% of children aged 4-17 in the United States, making it a common disorder. Parents, most often mothers, are blamed and singled out by their social circle, making it the Internet one of the few places they can go for support. In the midst of increased judgment and blaming in society, mothers can go online to be reassured by one another that they are doing the best they can to help their children. This entry was posted in InquiryProject on November 24, 2015 by marina. #1) A recent Parents.com poll showed that most parents have never actually seen or been involved in a dispute with another parent online, even though they hear or read about “mommy wars” all the time. This shows that mommy wars are more of a fabrication than an actual experience for parents. #2) A Pew Research Center survey showed that almost 2/3 of parents receive support from friends, family and strangers online. A vast majority of mothers, specially, said they receive support, seek information and ask for advice on social media. One great example is the Facebook group “Ask the Chicks,” in which almost 9,000 pregnant women and young mothers participate. A survey conducted with some of the group’s members found that the possibility of receiving tailored advice is what draws them to these kinds of groups instead of simply Googling about their issue. #3) Forums dedicated to parents facing the challenge of raising a child with behavioral problems, mental illnesses or disabilities offer privacy, information and support. Parents see these online places as the best way to get first hand accounts from others with similar problems but more experience dealing with them, as sometimes medical and professional advice fails to consider each family’s individual needs. #4) Mothers who suffered a miscarriage or the loss of a child can greatly benefit from sharing their experiences online. A case study of Angie Smith’s blog, created when she received the news her unborn baby would not survive after birth, provided several examples of readers’ reports that learning about other mothers suffering the same loss was crucial for their grieving process. Another study conducted with a bereaved parents group on Facebook found that, for the participants, the most important aspect of the group was sharing their grief with others who understood their pain in a way that their relatives and friends did not. These two examples show that, through the Internet, parents can transcend geographical and social borders to connect, share and support one another through miscarriage and death. This entry was posted in InquiryProject on November 14, 2015 by marina. I chose Atavist because I really liked the sample websites they had on their page. Using this platform kind makes me feel like I’m writing for a real news site…They have several designs that remind me of The Atlantic website, for example. I like how easy it is to put videos, gifs, sounds, images, etc. I plan on using most of these features to make my IP more interesting. This entry was posted in InquiryProject, realestate on November 13, 2015 by marina. A few months ago I was browsing Facebook and came across a post by a friend of mine who recently had a baby, her first child. At the time the little boy was not more than a few weeks old, and my friend was still learning how to take care of him. In her post, she was asking for advice from other mothers on how to soothe a colicky baby, since her child had been crying for hours and nothing she did seemed to work. Well, she got several replies because her friends had A LOT of opinions about how to treat colic. Which is perfectly fine – knowledge is power and so on – but a few of the commentators attacked other moms because their methods were not “the right ones.” My friend inadvertently started a “mommy war” on her Facebook page, because apparently there are many controversies when it comes to soothing a baby with colic. This anecdote illustrates a very common trend seen in social media today: parents are increasingly using these platforms to seek advice and support from fellow parents, just like my friend did. However, it has also become common for debates to pop up on social media over several parenting-related topics: breastfeeding vs. formula, cloth vs. disposable diapers, and, of course, vaccinating vs. not vaccinating, just to name a few. What was supposed to be a fun place to stay connected to friends and family suddenly becomes a battleground, with parents fighting each other over personal choices that, in the grand scheme of things, probably won’t make too much of a difference in the future. Thus, social media, especially Facebook, might not be the best place for parents with questions. 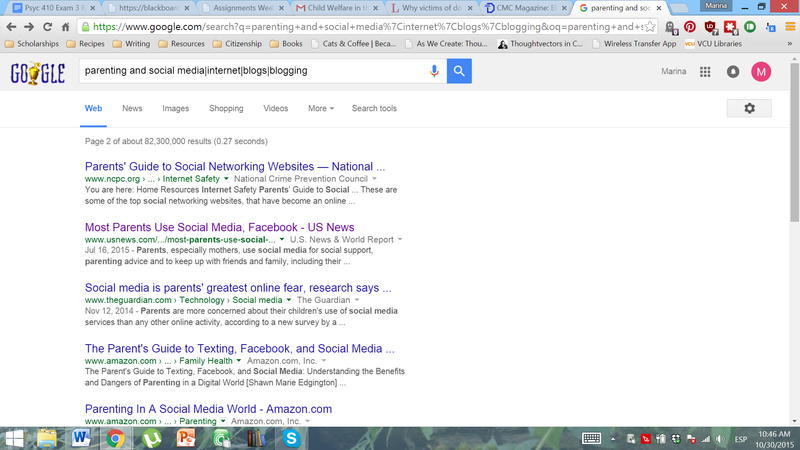 However, that does not mean the Internet as a whole is useless for when it comes to parenting help. Online spaces such as messaging boards and blogs offer anonymity and privacy for parents facing challenges such as raising a child with behavioral issues, mental illness or disabilities. Additionally, parents who suffered the loss of a child or a miscarriage are very likely to benefit from discussing the issue with their peers who had a similar experience. Therefore, when used appropriately, the Internet offers great resources to parents that were not available before. When mothers were more frequent visitors to their Facebook accounts and managed their accounts more frequently, however, they reported higher levels of parenting stress. As exemplified by my anecdote above, Facebook discussions can get personal very quickly just because of its nature: you can learn a lot about a person just by looking at his or her profile. But parents using forums and blogs don’t need to share personal information to be able to discuss ideas with other parents. They can just use a random username, or even stay anonymous, and join in. That makes it less likely that parents will be personally attacked for their opinions. Another important characteristic of forums and blogs is that parents can discuss sensitive issues without fear of someone finding out about, which can easily happen on Facebook. For example, a parent can discuss their child’s ADHD diagnosis without fearing that a potential employee in the future will read about it online. For parents who want to discuss losing a child to death or miscarriage, blogs and forums can be great for receiving support and “normalizing” their experience, that is, seeing that they’re not alone and it’s ok to discuss what happened. This entry was posted in InquiryProject on November 9, 2015 by marina. This entry was posted in InquiryProject on November 3, 2015 by marina. Nelson, J. (2015). Why Parents Should Be Mindful of (Over) Sharenting. Retrieved from http://yourteenmag.com/2015/09/sharenting/. Then there’s the possible impact on your adolescent’s real-world life. Sure, that may seem improbable, but it is a possibility, say the experts. Social media activity can live on forever, and many more people are privy to our activity than most of us may realize. These two nuggets are very similar, probably because they come from articles discussing the results of a poll conducted by the University of Michigan C.S. Mott Children’s Hospital which questioned parents about their online habits. I chose these passages because I believe that parents today, as the first generation raising their kids in a world where the Internet, social media and blogs are widely available, perhaps have not anticipated the consequences of the so-called “sharenting” (a mash-up of the words “parenting” and “sharing”). As mentioned in the passages above, what we publish online can literally live forever. Even if we delete a post, someone could’ve easily taken a screenshot of it and saved it – and that happens a lot nowadays, especially when someone posts something embarrassing or dumb online. So it wouldn’t be completely far-fetched to think that a “cute” potty-training Facebook post shared today could one day be seen by a college recruiter, a human resources employee, a future boss or a potential business associate. And while I personally wouldn’t judge someone by their parents’ oversharing, I don’t believe everyone would be so kind all the time. Another problem that comes to mind, more serious than posts about potty-training, temper tantrums and made-up words, is that some parents might inadvertently share medical information online. 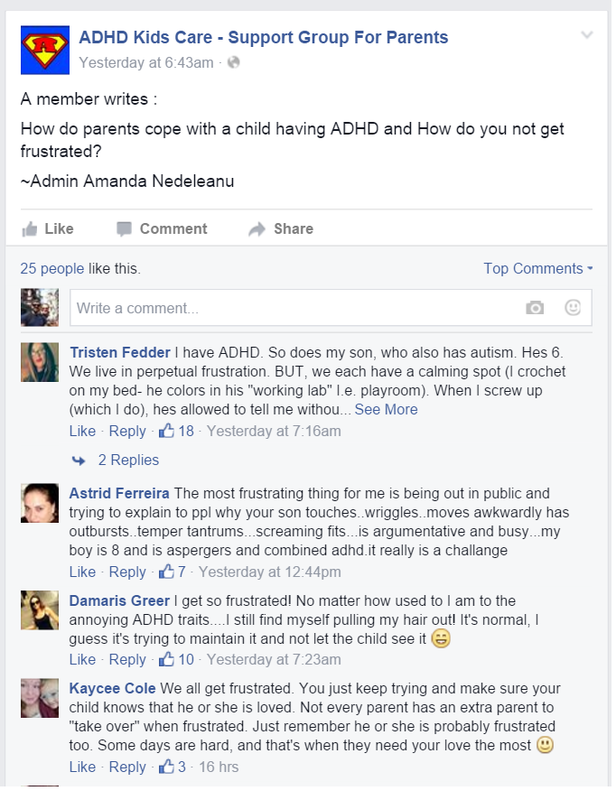 I personally have seen parents discussing their kids’ ADHD diagnosis and medications on Facebook. This kind of sensitive information should remain private, because even though discriminating against someone because of a medical condition is a crime, we can’t be sure that won’t happen anyways. Therefore, the message is very clear for parents everywhere: think before you share. This entry was posted in InquiryProject, Nuggets on November 2, 2015 by marina. Are Attractive Female Tennis Players More Successful? An Empirical Analysis. (n.d.). Retrieved October 27, 2015. This article caught my attention because it exactly what i am researching. The article is about a study that analyzed the relationship between physical attractiveness and sporting performance in female tennis players. It studies whether the attractiveness of these female athletes impacts their success in terms of prize money that is earned and their probability of winning. They did this study by investigating professional female tennis players who were ranked in the top 100 of the tennis world ranking. The study used a logit model which showed that the larger the difference in physical attractiveness, the higher the probability of winning for the more attractive tennis player in individual matches. These findings indicated that the higher the physical attractiveness of a female tennis player, the higher the prize money earned in a single season as well as in the whole career. “Lastly, there is a link between the physical attractiveness of female athletes and online popularity, media coverage endorsement and fit as an endorser In particular, ‘feminine’ sports such as figure skating, exhibition swimming and tennis are more popular in the mass media than ‘masculine’ sports such as rugby. Moreover, attractiveness has become increasingly utilized in promoting and selling ‘feminine’ sports”. According to this section of the article, the physical attractiveness of a female athlete determines how successful she is in terms of endorsements, and the amount of press she gets. Also, pretty women who play “pretty” feminine sports have more opportunity in mass media, regardless of their skills. Is a female athlete really considered less attractive is she plays a more “masculine” sport? This hit home with me. I grew up as a tomboy, very outdoorsy and very into sports. However, I am also a girly girl when it comes to appearance, makeup, and fashion. 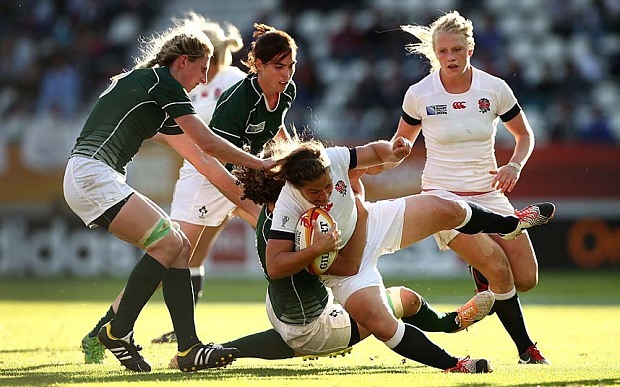 I am also a girly girl who plays rugby. I’m the girl who takes off her cleats after a game and puts on strappy heels. Its discouraging to learn that a woman could be an extremely skilled figure skater, but she has less of a chance of being endorsed because she is not physically attractive in the eyes of society. It’s really upsetting to know that women are viewed differently and deemed less attractive for playing a more masculine sport. Its also upsetting to know that they have less of a chance of being endorsed or being popular in mass media because of the “masculine” sport that they play regardless of whether they are more or less attractive physically. I understand looks are important in the advertising industry, however, I feel when it comes to athletics one should be judged more on skill. It comes to show that not only does the physical attractiveness of a woman effect their job applications, earnings and careers in the corporate world, but also their sporting success. “The former female tennis player Anna Kournikova is probably one of the most beautiful athletes and has attracted a lot of media attention although she has never won an individual professional tennis tournament. Moreover, Kournikova’s physical attractiveness is continually associated with her rather unsatisfactory sporting performance, so that even a poker starting hand was named after her. The starting hand Ace/King was nicknamed after her, due to the same initial letters, but mainly because each ‘looks great but never wins”. This was the first statement made in this article. This was what immediately caught my attention and made me want to continue reading. What I got from this paragraph is that although Kournikova is not one of the best, she is still better known due to her beauty and not her skill. However, the opposite is done to her, her beauty is blamed for her lack of skill. According to the media, her physical appearance is why she has never won an individual tournament. I am not a tennis fan. I have never followed the sport and I don’t know many players. However, I do know about Ana Kournikova. I assumed she was one of the best because she is one of the only other tennis players that I hear about on the media other than the Williams sisters. After reading this I learned that she is in fact not one of the best. Moreover, she is known and she is popular in the eyes of society because she is attractive. In my opinion, physical appearance should not be one of the reasons why you are deemed successful when it comes to sports. This entry was posted in InquiryProject on October 27, 2015 by hosna. Griscom, R. (Producer) & Volkman, A. (Producer) (December 2010). Let’s talk about parenting taboos. USA: accessed 10/27/2015. http://bit.ly/1PPdbzd. So taboo number three: you can’t talk about your miscarriage — but today I’ll talk about mine. As I was working through that mourning process, I was amazed that I didn’t want to see anybody. I really wanted to crawl into a hole, and I didn’t really know how I was going to work my way back into my surrounding community. And I realize, I think, the way I was feeling that way, is on a really deep gut level, I was feeling a lot of shame and embarrassed, frankly, that, in some respects, I had failed at delivering what I’m genetically engineered to do. And of course, it made me question, if I wasn’t able to have another child, what would that mean for my marriage, and just me as a woman. And I just remember feeling all these stories came out of the woodwork, and I felt like I happened upon this secret society of women that I now was a part of, which was reassuring and also really concerning. And I think, miscarriage is an invisible loss. There’s not really a lot of community support around it. There’s really no ceremony, rituals, or rites. And I think, with a death, you have a funeral, you celebrate the life, and there’s a lot of community support, and it’s something women don’t have with miscarriage. These two nuggets demonstrate that parents, especially women, suffering the loss of a child greatly benefit from being able to discuss their mourning openly with others. However, as Alisa and Rufus explore on the video above, miscarriage (and I would add child death) is a taboo topic so most people rather not talk about it – even though “15 to 20% of all pregnancies result in miscarriage” as Rufus mentions. Alisa’s story supports the notion that the Internet is a crucial tool for mourning parents, as discussed by Whitehead (2015). 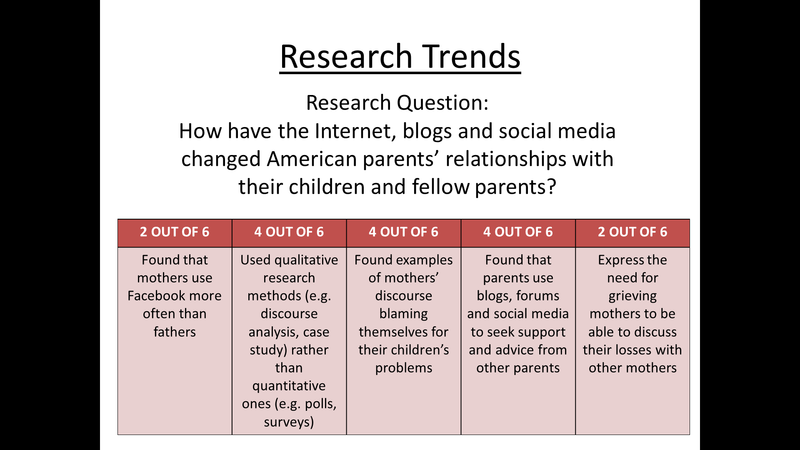 In this article, the author argues that blogging about the loss of a child allows parents to reframe their experience, making it meaningful to the bigger context of their families and communities. Of course the ideal would be for the taboo to be broken and parents discuss their experiences in “real life”, but as mentioned on the video the majority of women who suffered a miscarriage blamed themselves for what happened, and 22% said they wouldn’t even tell their spouses about it. So clearly we still have a long ways in making this topic normal. Until then, forums, blogs and social media offer privacy (and sometimes even anonymity), and the possibility of extending the much needed conversations to virtually every corner of the world. 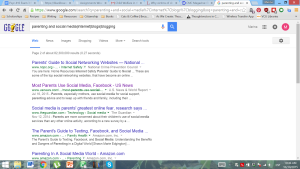 This entry was posted in InquiryProject, nugget, Nuggets, Video Research on October 27, 2015 by marina.